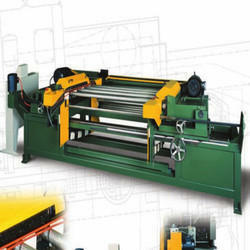 Our product range includes a wide range of wire brush deburring machines. Manufacturing. Automatically deburrs tubes, bars, and profiles. Sturdy welded frame and brush head mounting. Precision brush shafts assure smooth operation. Large conveying chains and sprockets for uninterrupted production. All components of the highest quality available. Easily accessible adjustments for tube length, brush height and brush pres- sure. Brush shafts are easily removed for brush changeover. Machine can be either manually loaded or fed from an optional tube transfer system from the cutoff operation. Cut tubes or bars are conveyed automatically between two rotating wire brushes. Part lengths are set by adjusting a movable brush head in relation to a stationary brush head. Burrs are simultaneously removed from both ends. With tubing sections the inside diameter and outside diameter are deburred at the same time. When brushing squares, rectangles and other shapes, notched guide rails are used to assure rotation of the part during the brushing operation. The height of the brushes can be adjusted to achieve the best results for your application. Tube Diameter 1/4"– 3" 3/4"– 5"
Tube Shapes Square 2.25" x 2.25" max. 3.5" x 3.5" max. Tube Length Minimum 6" through 120" Minimum 8" through 120"
Cylindrical Brush Length 24 Inch 36"
Diameter 10" or 12" 16" or 12"